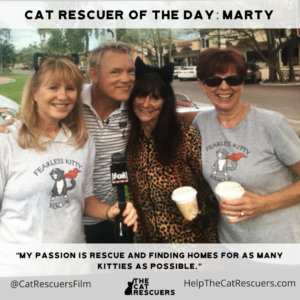 4/24 Cat Rescuer of the Day: Marty! I have been with Fearless Kitty Rescue four four years. I head the TNR team, facility manager, foster the tiny kitties to the wild ones and work to tame them, train new volunteers, do an Internet program, attend events and dress up as a cat as the mascot. We had a feral family who lived close to our facility. We trapped them and were able to adopt the kittens out, Mom and Dad were too feral so we released them. Over the next two years, the Daddy hung out on our patio and myself and another volunteer were able to pet him. Our facility was going to move and we had to make a decision to trap him and bring him or leave him. Our decision was made when we saw a big open cut on his paw. At the vet we found out he is FIV. He is in our facility safe and sound, learning to let others pet him and now big Daddy has another FIV kitty friend in their private room.. he has a special place in my heart. I was amazed to know how many cats one unfixed cat can be responsible for in just seven years, let alone their entire life! Also, that a cat is not just a cat. They are just like humans, they all have their own personality. You need to choose a kitty that fits your personality, and not choose by the color of their fur. I enjoy working with the elderly. I love swimming, water sports, and golf. 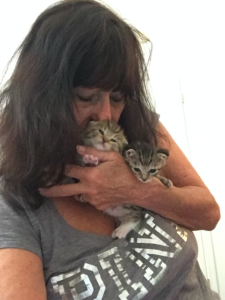 My passion is rescue and finding homes for as many kitties as possible. I love to learn as much as I can and I believe this film will help inform many people on how important it is to spay, and neuter their own pets as well as the wild ones. Thank you? Go follow Marty on Instagram (@AMalovescats). And be sure to follow @CatRescuersFilm on Facebook, Twitter and Instagram!